1. 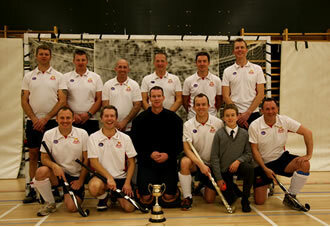 The Army Masters were looking forward to the 2013/14 season with the hope of winning the Inter Services Crown. The squad was similar to the previous season with the very welcome addition of some young blood, in Neil Bellamy, Keith Miles, Neil Fassam, Carl Jessup, Derek Farr and Matt Ketterer. I would also like to welcome back Col Alex Taylor. Operational Trg meant our stand in skipper Mark Ison was not always available and Tim Wood missed the first half of the season through injury. 2. The usual opposition were there again to give us a run out in the early part of the season as we started at home against Fleet & Aldershot followed by United Services Portsmouth; then there was a lesson in hockey from United Hospitals Hockey Club (Match write up below); follow by the Nordics to take us to the Christmas break. 3. Army Masters v United Hospitals Hockey Club. The icing was on the cake to start with 15 doctors all under the 23 arrived at 1845hrs feeling very confident and within minutes starting there warm up routine. The Army Master Team managed to get a squad of 12 with me as the Sub; and within minutes of the start another 3 Doctors turned up! The plan was to keep the ball; move it across the back; stretch the play and not get into a chasing match as there was only ever going to be one winner. After the first ten minutes play which went to “plan” we started to struggle for options, trying to force the pass; and lost the knack of passing the ball to someone wearing the same colour shirt. Thanks to Colin Ball making some outstanding saves we finished the first half four nil down; it may well have been a slightly different story if we had put away one of several short corners opportunities. Mark Ison gave an inspirational team talk which within seconds of walking back on the pitch went out the window as they scored another two very quick goals. However the UHHC didn’t have it all there own way; 3 fantastic short corner routines from Mark Ison and Mark Hunniset helped to make the score more respectable. As their fitness and youth paid off and the gaps appeared we end ended losing the game 9 – 3. 4. Army Masters v Guildford Hockey Club. On a wet night when half of the team were hoping they were going to get the call that the match was cancelled we ended up looking at a very young fit Guildford Masters Team with only a few old and bold to make up the numbers. We set up in the new formation that Wayne Masters hoped would lead us all the way to winning the Inter Services with Charlie Drake and Neil Fassam using their pace to exploit the channels at every opportunity; James Relph doing the holding role allowing Wayne Masters and Terry Pollard to support the front three. The game plan started really well; moving the ball around the back stretching the play (a bit dodgy at times); using Relphy to create the opportunities further forward with the team creating several short corners opportunities. This is when it became very apparent that we need to put some practice prior to the IS comp. The defence stood strong but shaky at times with two against four on too many occasions; and then an avalanche of goals came in a ten minute spell just before half time; making the half time talk so much easier; or so we thought. 5. Army Masters v Chichester. The match against Chichester was played in perfect conditions with all the Squad that was available making it on time less Flash. We started in the new formation with players looking very comfortable and assured; with the opening ten minutes camped in Chichester’s last third; creating various opportunities but once again not scoring enough goals from short corners. Very much against the run of play Chichester scored from a short corner which deflected in of Kev Edwards stick. The Master team look very good going forward with Wayne Masters and James Relph pulling the strings and Tim Wood using pace on the right wing. After going 2 – 1 up rotations were made with Derek Farr and Edd Sutthery making an impact on the game with great strength and energy. We finish the half 3 – 2 up with Al Chick and Wayne Masters taking a break. We started the second half very strong and scored very early on to maintain the two goal lead. Colin Ball was having an inspired game once again for Chichester; however it was short lived as Mark Hunniset found his range from a couple of short corners to firmly put us in the driving seat. 6. The Army Masters came back with a bang this year after coming 3rd last November; with Wayne Masters, Mark Ison, Andy Lowe and Al Chick all not available; it was left to Lt Col Neil Bellamy with the Captains Arm Band, James Relph, Charlie Drake and Mark Hunniset to put in some outstanding performance’s and excellent teamwork to beat the RAF first with a result of 6 – 3. With Paul Symns in goal the Sub rotation was controlled by Carl Jessup and Col Dickie which proved really effective. The game against the Navy was hard with two games back to back and at half time they went in 3 -1 up. With Neil’s inspirational team talk and Relphy drive we beat the Navy 5 - 4 with a fantastic comeback to become the Masters Indoors Inter Services Champions. 7. 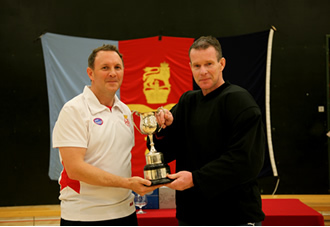 This year’s competition was being hosted by the Royal Navy, at HMS Temeraire. This meant we had to play two games on the second day of the Inter Services and this is often a big ask for aging legs! The 3 squads were as close as they had been for a number of years and it promised to be an exciting tournament for the Masters. 8. 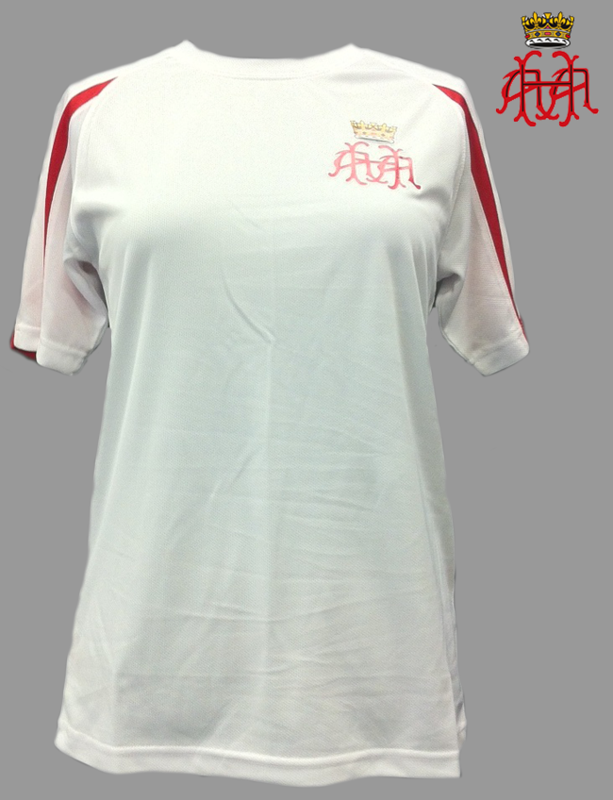 Army v RN. This year the Army had no selection and availability problems; apart from Keith Miles, Al Chick and Col Alex Taylor. Tim Wood had been rested for three weeks after picking up an injury against Chichester; and Mark Ison was available. The Army quickly got into their stride and played good flowing hockey from the off. Tim Wood opened the scoring on 5 minutes and Neil Fassam added a second, with a well taken goal, giving the Army a 2-0 lead within 15 minutes. The Navy came back strongly and played some good hockey causing concern for Army’s defence. Their pressure told and they scored on the half-hour mark, but Army quickly hit back a minute later when Ed Sutthery struck a fierce shot home making the half time score 3-1 to Army. Within ten minutes of the second half the Navy had score twice as the Army seem to press the self destruct button; lacking discipline; not taking chances and to make matters worse Tim Wood was out injured for the remainder if the tournament. Then there was the turning point; one of the Navy players was injured; causing a long delay which seems to play to the Army advantage. After the re-start the Army were transformed, working extremely well as a unit, defending high up the pitch and putting the Navy under considerable pressure. Mark Hunniset had one of those days when his shots wouldn’t go in but his support play was outstanding as he set up chances for Terry Pollard and Iain Harrop as the Army ran out deserved winners 5-3. 9. Army v RAF. The game against the RAF was always going to be hard with two games back to back. The Army started of very confidently as Wayne Masters’s inspirational team talk took hold; but you have to take your chances when you’re on top; and Mark Hunniset had certainly forgotten how to take his chances that he had been putting away all season. After a couple of good saves by Colin Ball the RAF took the lead through a deflected goal. Within minutes the RAF were given too much space in the middle of the park with us showing little penetration the RAF doubled their lead in the 25th minute and were deservedly 2-0 up. The RAF piled on the pressure and exposed our defence to one on one far too often and scored 2 more goals; however the Army did mange to score just on the break leaving the Army chasing a 4-1 score line. The Army had strong words during the interval and knew that their whole season now rested on the next 35 minutes for which they needed a big effort. From the start of the second half Army were transformed, working extremely well as a unit defending high up the pitch and putting the RAF under considerable pressure. Within 5 minutes Terry Pollard slid in to start the fight back from a short corner. For the next ten minutes both sides were cancelling each other out; and then from a break away Ed Sutthery a great goal bring the score back to 4 – 3 with fifteen minutes to go. 10. Inter Services Summary. It was a close tournament with all 3 sides playing some good hockey. The RAF were deservedly crowned the Inter Services Masters Champions 2014. 12. It is always a good season when you win the Indoor Inter Services, but it was a close run thing in the Outdoor Inter Services; we must continue to build the squad around our decisive and fast flowing hockey. It’s been great this season to play all our home fixtures at Aldershot again and been able to host our opposing teams accordingly. 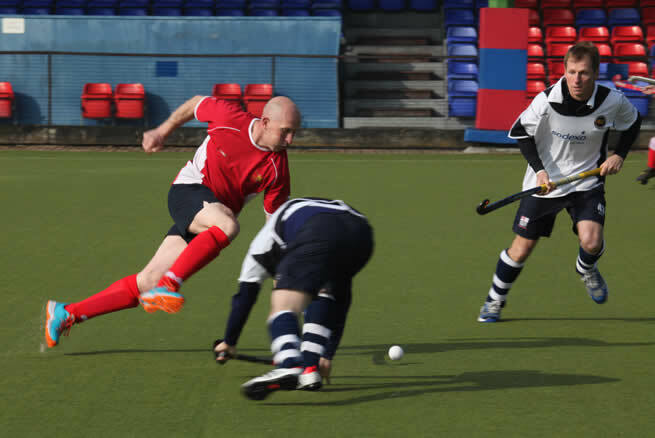 This season has seen some fresh new faces; and one or two old faces that Wayne Masters had talked out of retirement to relive that passion on the hockey pitch. Have a restful summer and we look forward to renewing old acquaintances next season.